The Symposium's final report and presentations are now available. 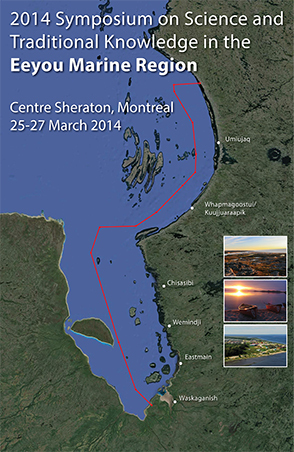 In collaboration with the Eeyou Marine Region Wildlife Board (EMRWB), ArcticNet is organizing the 2014 Symposium on Science and Traditional Knowledge in the Eeyou Marine Region to be held in Montreal from 25 to 27 March 2014. The EMRWB was created under the land claims agreement between the Government of Canada and the Grand Council of the Crees (Eeyou Istchee). The major goal of the symposium is to take stock of the state of scientific and traditional environmental knowledge in the Eeyou Marine Region (EMR) to help identify future research priorities within the framework of the $5M Research Fund awarded to the EMRWB. The emphasis will be on the marine environment of James Bay and southeastern Hudson Bay. © Copyright 2019 Eeyou Marine Region. All rights reserved.